The Roccbox Portable Stone Bake Oven Will Bake You A Pie In 90 Seconds | OhGizmo! Burgers, dogs, and kabobs are stapes at BBQs. But it’s not too often you’ll see people making pizza. That’s because tossing an uncooked pie on a regular grill might not get you the best results. But if you pack the Roccbox, everything changes. The innovative design features a slab of stone, and a specially designed rear burner that works either with gas or wood. In 15 minutes you can have a 500C (932F) oven, which can take your pie from raw to cooked in 90 seconds flat. The outer section is covered in a protective silicone shell, which helps in not getting your fingers toasted along with your pizza. 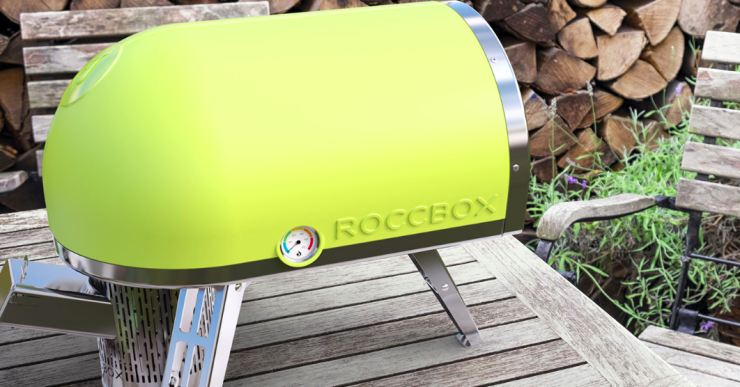 But it isn’t only pizza that you can make in the Roccbox: “it enables the baking of breads, cooking of fish, roasting of meats, vegetables, desserts and much, much more.” It is portable at 20kg (44lbs), but not exactly super light. Still, for what it does, we are intrigued. And at £349 ($541USD), it’s not outrageously expensive.